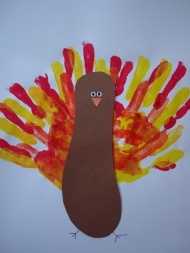 Try this Hands and Feet Turkey craft, it's a fun and personalized way for children to make their own Thanksgiving turkey! A great craft for Toddlers and Preschoolers as well! 1. Pour some fall colored paint into a paper plate or shallow dish. Try just using red and yellow paint, when the colors mix they will make a nice fall orange color. Either dip your hands in the paint or brush the paint on, and then press onto paper in a fan shape. 2. While you're waiting for the paint to dry, trace a foot on brown construcion paper and cut out your turkey's eyes and beek. 3. When your paint is dry glue on your turkey's body. Draw on some legs with a marker if you want!